This view has taken firm hold and it’s easy to see why. Just call it confirmation bias. You think a Master’s will confer a competitive advantage in the job market? Well, chances are you’ll find the evidence you’re looking for; a quick search on Google generates some pretty compelling and convincing headlines. Throw in some media hype about devalued first degrees, and high levels of graduate un(der)employment and suddenly postgrad study seems like a wise move. There are very few ‘heart sink’ moments within careers, but there’s one scenario which tests the resolve of the most optimistic careers consultant: students who drift into postgraduate study, with no discernible motivation or career direction. It’s easy to see why this happens: job hunting takes time and the sheer weight of information, events and advice can seem completely overwhelming, and sometimes impenetrable. Maybe it’s just easier to defer your job search for another year? Perhaps you’ve yet to find your niche and think an extra year’s study will help you find clarity and if not, you’ve always got qualification to fall back on. Does this sound like you? If so, stop and think. Everything we know about the current job market – and student behaviour – suggests that falling into postgraduate study, without understanding how and why it will benefit you, may compound your problems, and not alleviate them. A full time Master’s is really intense, leaving little time to find work experience or further your job search. And when you finish, you’ll be competing with a new batch of graduates hungry for work. Postgraduate study can be a really positive, enriching experience, but it requires strong motivation and focus. Before you commit both time and money, ask yourself what you hope to gain. In some sectors a Master’s qualification is almost a pre-requisite; you might get on the first rung of the ladder without one, but you won’t climb any higher – not unless you’re seriously impressive, with publications to your name or a patent up your sleeve. If you’re considering a career in museums, libraries, social work or R&D a Master’s degree is almost essential. Chartership in both psychology and engineering is similarly dependant on securing a Master’s level qualification. And for the budding social scientists out there, an MSc in Research Methods presents a sound investment of time and money. For less vocational, more academic Master’s degrees the career benefits are not immediately obvious. That’s not to say it won’t pay dividends later on in your career; strong academic credentials and substantive work experience combine in a pretty powerful mix. Just don’t expect a graduate recruiter to fall over themselves in awe; for the most part, Master’s degrees have little intrinsic value at the entry or graduate level. 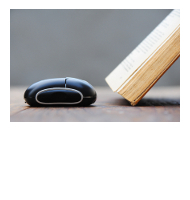 Last year, along with my colleagues from the *AGCAS Postgraduate Students Task Group I conducted some research into the myths surrounding postgraduate study (many and legion) as well as recruiter attitudes. I confess up front to a small sample size and relaxed approach to research methodology, but the results seem to reflect wider trends and the experience of colleagues working in careers and graduate recruitment. Most employers – across most sectors – will not distinguish between first and second degree applicants. Very few recruiters offer distinct recruitment streams for Master’s graduates. In terms of a clearly differentiated market for Master’s applicants, it seems the myth is well and truly busted. Don’t assume there’s a financial premium attached to those extra letters. Salaries vary according to sector, role and organisation – rarely degree status. You might be able to command a higher salary if you are considered an ‘experienced hire’ and have pursued Master’s study to continue your professional development, otherwise you will simply start on the same salary as a graduate recruit. 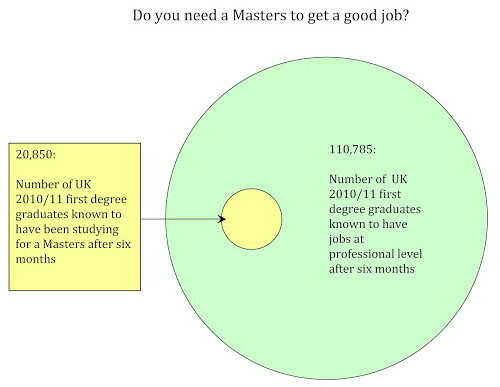 A Master’s qualification will not (generally) compensate for a lower degree classification (<2:1). Most graduate employers are looking for a 2:1 or above, but don’t career success doesn’t start and stop with the Times Top 100. Why not be more creative in your job search and consider the SME route instead? SMEs are crying out for bright, capable graduates and may have a more flexible approach to entry requirements. Before you commit to further study and further debt, ask yourself this: what do you hope to gain? If it is career advantage, then make sure you have fully researched whether an MSc or MA is needed for your area of interest. Look at the destinations information for graduates from prospective courses and see whether this fits your (desired) career trajectory. The destinations data is not wholly reliable as it only captures graduates six months after graduation; nonetheless, it can still help you spot patterns and trends and weigh up the pros and cons of further study. I’m certainly not going dissuade you from studying at postgrad level; I took an MA in Contemporary History and Politics (hardly a recruiter’s dream!) and loved every minute. My dissertation topic has proved to be an interesting talking point at more than one interview, and there’s no question I developed skills I’m still using today in my current job. However, whilst there’s been a fair passage of time since my student days, one thing holds true: a Master’s will not automatically fast track you to better, more satisfying, and more remunerative jobs. Tags: Employability, Job search, Postgraduates. Bookmark the permalink.